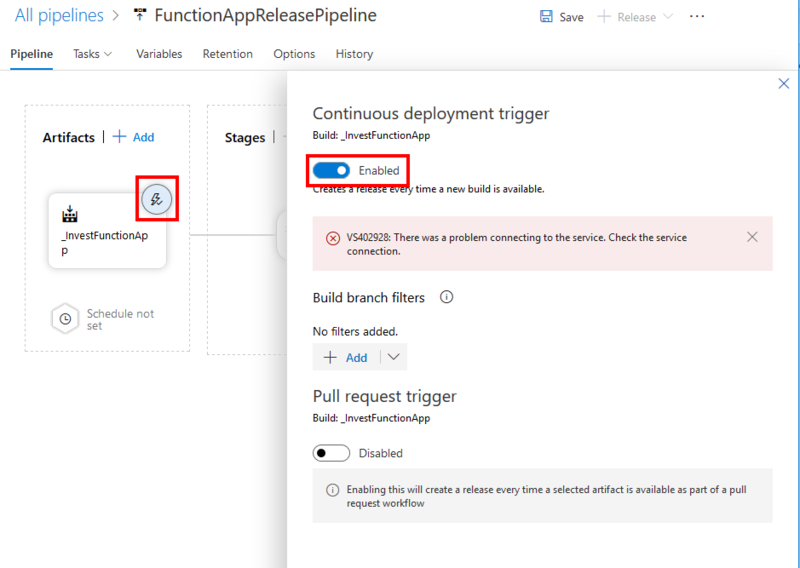 This is the sixth part in a series demonstrating how to setup continuous deployment of an Azure Functions App using Azure DevOps build and release pipelines. In the previous instalment we saw how unit tests are executed as part of the build pipeline and that if tests fail then the build fails. 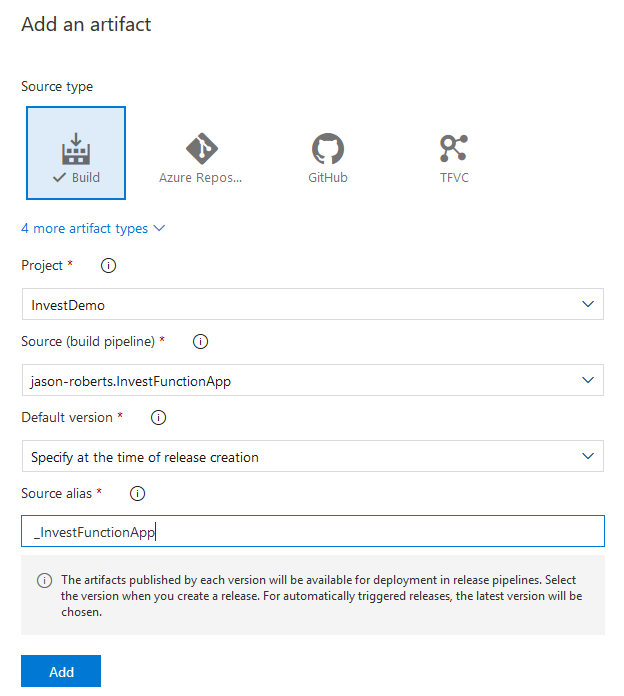 If the tests (and the rest of the build) succeed, a release pipeline can be triggered to deploy the Function App automatically to Azure. Next we need to add artifacts from the build pipeline to be used in the release. To do this click the Add link in the Artifacts section. You will now have a new task in the stage that will state: “Some settings need attention”. 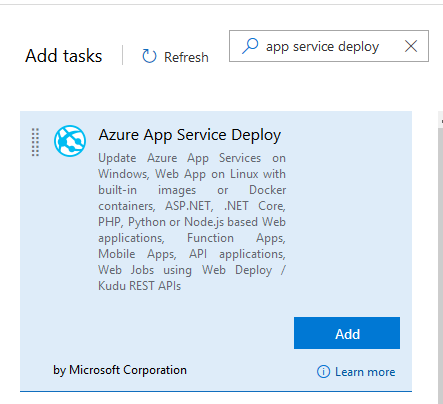 Click on the newly added Azure App Service Deploy task to configure it. First you’ll need to specify the Azure subscription you want to deploy into - you will need to click the Authorize button and go through the authorization process. Next change “App type” to “Function App”. 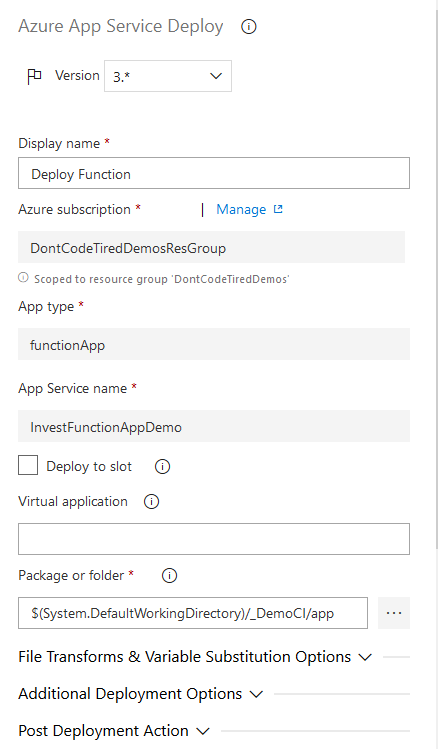 From the App Service name dropdown select the Function App you want to deploy into, in this series it’s the InvestFunctionAppDemo function created earlier in this series in the Azure Portal. Later in this series we’ll be adding functional end-to-end tests that make use of a number of test functions. 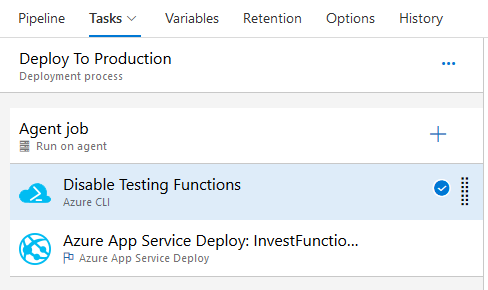 We do not want these test functions to be enabled in the deployed production Function App in Azure. (In the next part in the series we’ll discuss these testing functions more). 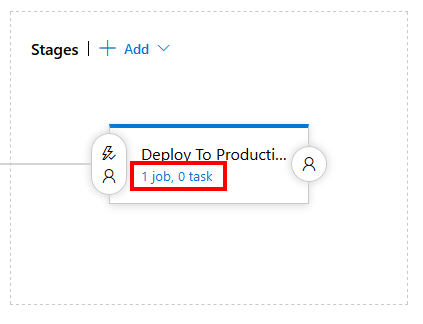 To disable functions in Azure Functions V2, a setting can be added in the format “AzureWebJobs.FUNCTION_NAME.Disabled” and set the value to “true”. One way to do this as part of the release to production is to use the Azure CLI. 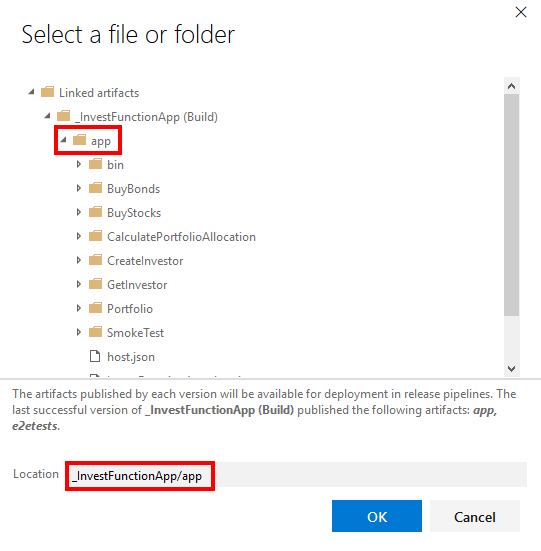 This preceding script uses the az webapp config appsettings set command specifying the resource group “-g DontCodeTiredDemos”, the name of the Function App “-n InvestFunctionAppDemo” and the setting name and value “--settings AzureWebJobs.CreateInvestor.Disabled=true”. 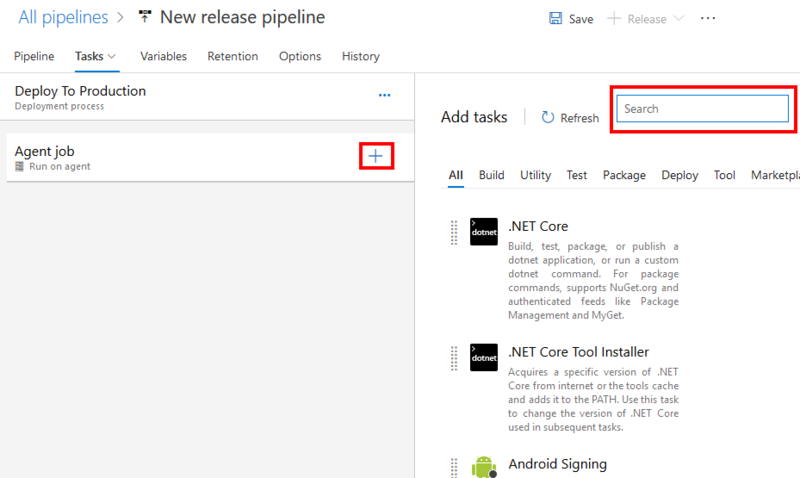 At this point you can also name the release pipeline by clicking “New Release Pipeline” at the top and choosing your own name, for example “InvestFunctionAppReleasePipeline”. If you get a “Problem connecting to the service” error message it may not actually prevent the CD trigger but you may want to refer here. Click the + Release button at the top right and click Create a release. Choose the latest build from the build pipeline in the Artifacts section and click the Create button. And once the release pipeline has executed you should see a “Succeeded” message in the Deploy to Production stage. To test the CI trigger, make a change in the repository, commit the change, and then push to GitHub. After a short while, the build pipeline should notice the change and kick off a new run of the build pipeline. 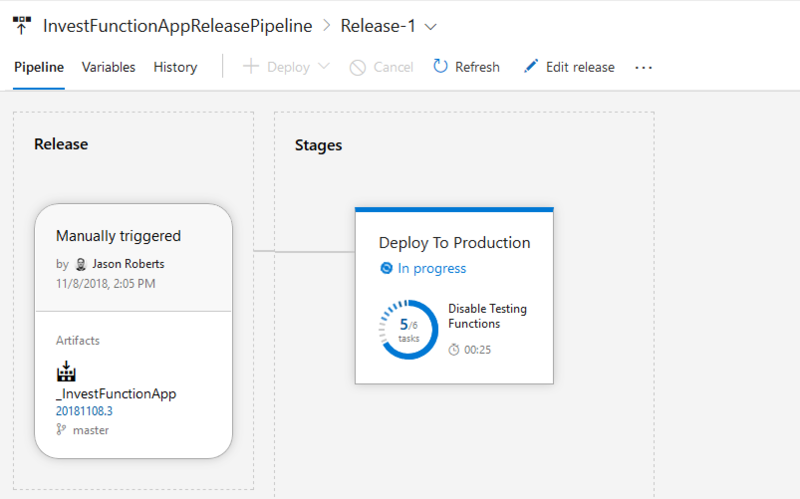 Once the build pipeline completes without error, the release pipeline should be automatically triggered and the changes (for Release 2) automatically deployed to the production Function App in Azure. So now, we can add a feature or fix a bug, push the changes, and within a few minutes have the new feature or fix in production without us having to do anything else. In the next instalment in this series we’ll add some functional end-to-end tests because at the moment ,all we have are unit tests in the build pipeline to verify correctness. Can you maybe do a final post on failure conditions? I'm getting lots of file-locked failures in my pipeline and it is really upsetting. 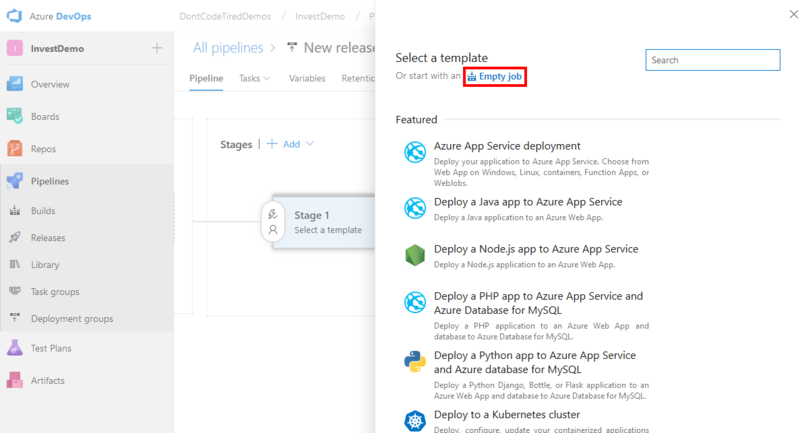 You write: "From the App Service name dropdown select the Function App you want to deploy into, in this series it’s the InvestFunctionAppDemo function created earlier in this series in the Azure Portal." 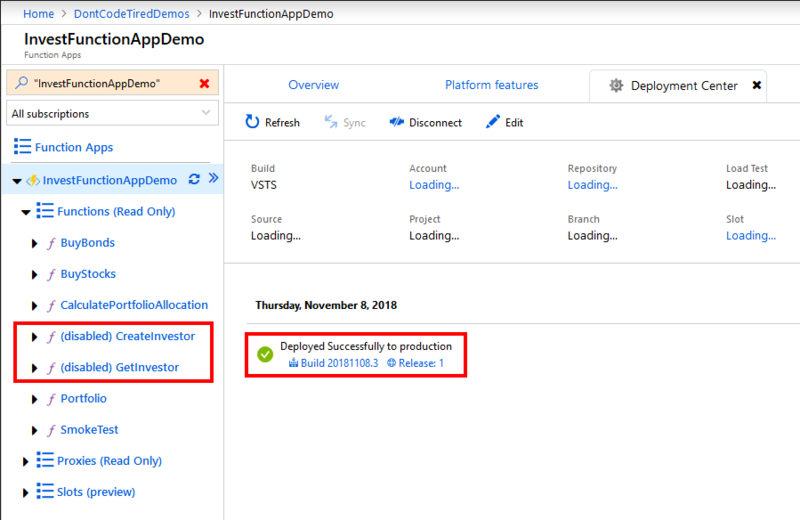 In which part of this blog post did you create the InvestFunctionAppDemo function in the Azure Portal. I cannot find it. Thanks.